* This exhibition has ended. 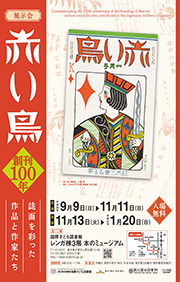 The International Library of Children's Literature (ILCL) announces an exhibition entitled Commemorating the 100th Anniversary of the Founding of Akai tori - Authors and Poets Who Contributed to This Legendary Children's Magazine, to be held at the ILCL from September 9, 2018, to January 20, 2019. 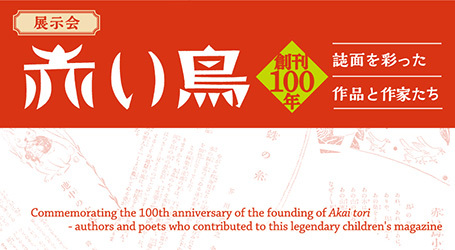 2018 marks the 100th anniversary of the launch of Akai tori, a magazine which specialized in publishing stories and songs for children. This exhibition features materials that illustrate the role played by Akai tori in the history of Japanese children's literature. The publisher of Akai tori, Miekichi Suzuki, was himself an author and worked together with Hakushu Kitahara and others to enhance the quality of the stories and songs featured in the magazine.